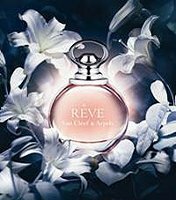 Van Cleef & Arpels will launch Rêve, a new fruity floral fragrance for women, in May. The notes feature pear, neroli, osmanthus, peony, sandalwood and amber. Van Cleef & Arpels Rêve will be available in 30, 50 and 100 ml Eau de Toilette. Update: Rêve was developed by perfumers Emilie Coppermann, Nathalie Feisthauer and Evelyne Boulanger. Additional notes include lily. What a pretty ad. It’s got pear, though. Bad sign. The only pear I liked was that Slumberhouse..but I liked only the opening..it turned into Burberry Brit after a bit..I hate that scent. Blech. Don’t think I’ve ever loved a pear scent. Best so far: MDCI Belle Helene. Mmm, haven’t heard of that one in particular. I may check it out..though..not banking on pear! At least there’s no pink pepper or oud…. Replace the pear with peach and I’m all for it. But then, it might become too ordinary. Pear AND Osmanthus…. HEAVEN!!!!!!!!!!!!!! Living for that bottle and that Colour and knowing I MUST BUY! I am already Captivated and HOOKED! The bottle and the osmanthus may help me overcome my pear-phobia. We shall see.